We Be Reading: "We called him the Professor." 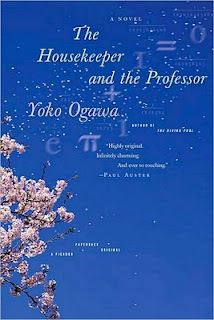 You're probably about to see a number of reviews around for Yoko Ogawa's short novel The Housekeeper and the Professor. It was this month's selection for the Japanese Lit Group and it's a wonderful book. A story of everyday life featuring not so ordinary characters, this book is told from the point of view of the "housekeeper" -- a nameless woman whose difficult upbringing and young pregnancy has given her very little advantage in life. She receives a new assignment one day to work for the "Professor". He lives in a cottage adjacent to the home of his sister-in-law and has a unique brain injury from a car accident years before -- his short-term memory only lasts for eighty minutes. He wears a suit covered in small notes that remind him of the little things in life. 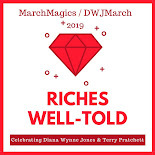 He is a difficult assignment in some ways but easy in others, in that he spends most of his time working on mathematical problems that he finds in a magazine. The housekeeper is fascinated with him and with the way he introduces her to the world of numbers and mathematics. When he insists that her ten year old son also come to the house after school, a unique relationship is formed between the three people. And yet, the question remains if they have a true friendship or not due to his limitations. I am finding it hard to choose the right words for this discussion. It is a touching story that is unique in its exploration of friendship, motherhood and a life that is anything but ordinary. I was surprised by how deep this book went in such a short time. I really felt like I knew these people and understood their trials and lives. This is also a new view of modern Japanese life for me -- complete with small details like meals and weather. I enjoyed these aspects of the book just as much as the characters. Finally, as I try to remember to do in any stellar translated work that I read, I also want to give credit to Stephen Snyder, the translator for this novel. This book is very accessible to all readers. Support our site and buy The Housekeeper and the Professor on Amazon or find it at your local library. We bought our own copy. I really loved this book. You did a great job reviewing it! Thank you for the clearest review yet of this book ... I hadn't really understood the premise until now. Love that cover! Gnoe - I am really enjoying the group reading experience too! Jenners - Thanks! It's important with foreign translated books to go into them with clear expectations or it could turn you off to a whole range of books. Thanks for reading along with us, and I'm sorry I didn't get back here to comment sooner. I completely agree with you about feeling like I really got to know these people even in a short time. And I thought the translation was good too, it seemed to read very smoothly. Glad you enjoyed it! Tanabata - Thanks for hosting the reading! I am having a good time stepping out of my comfort zone and exploring the world. Mel - I can't wait to read your review. I saw your Diving Pool review and am still not sure about reading it because of how dark it is. I'll think about it!